How would you want governments to bolster revenue within a province? Few of us would be happy with increased taxes or reduced services, but what about another lottery? I was waiting for the Number 1 line Toronto subway last week. 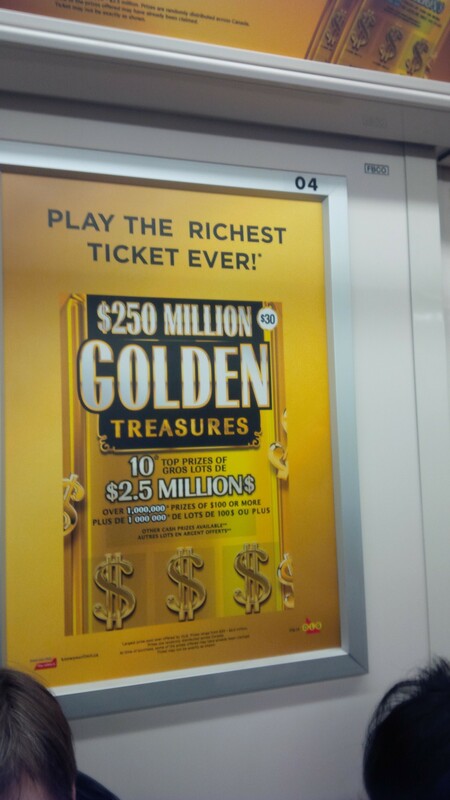 As the train pulled into the station, I realized it was completely gold covered in advertising for a new lottery from the Ontario Lottery and Gaming Corporation(OLG). Inside the train, every bit of advertising space was covered with ads for the same lottery, bathing all of us rush hour riders in the same golden glow. I looked all around to confirm it only to be confronted by still more of this artificial glow. I immediately began to question the OLG’s rationale for this advertising. I have two reasons for this. The first is that, like many Ontario doctors lately, I have questions about how the Ontario government is spending and investing money. I cannot quite believe that I would be the only person on that early morning train wondering if all this golden advertising for a new lottery is absolutely necessary. In the face of our economic situation, is covering a subway train inside and out with advertising really a good use of government spending. In fairness to the government, I took the subway five times last week and I only saw one golden train. My second reason for being concerned is the fact of the lottery itself. I am tremendously ambivalent about gambling. A great part of this comes from the fact that gambling is the fastest growing addiction among young people. It’s also a far more insidious addiction to recover from or treat since its link to health and mental health is not direct the way the way an addiction to a substance that one ingests is. Because of this, I am not certain that the government’s involvement in lotteries and gaming is a harmless way for it to raise revenues. To me, it is trying to fund what we need on the backs of the unhealthy, who need the government to develop innovative treatments not innovative enablers. Despite the above statements about not enabling those with difficulty resisting, I am also not a gaming prohibitionist. I know than banning something does not necessarily make it less accessible to those who must have it and I am certainly not in favour of tacitly supporting an underworld with prohibitionist measures. I hope the government also struggles with how best to balance between the “service” OLG provides while hopefully protecting the “public good”. Before publishing this, I thoroughly examined the OLG website. There is a section on “responsible” gambling, another on “consumer protection” and another that tells the visitor that OLG pours roughly $2 billion into Ontario’s coffers on an annual basis – an amount that’s also increasing. They outline quite precisely where the money goes in detail. If you compare this to the pie chart on the Government of Ontario’s website, you can see that the Ontario Health Premium brings in $3.3 billion for the government – the gross amount OLG collects, incidentally on all operations. Finally, I cannot say that writing this has helped me to clarify how to think about the government’s role in gambling because this is a difficult issue. But do we need a golden subway train? Don’t we all know that there is no golden train? Doesn’t the government know? Wow! I need not get hooked on this one, eh. Good blog?? Minor point, I like the way you worked in the $3.3B vs $2.0B …I would have been more emphatic…but that’s me! Amazing though? !